Previously, I had written a post on 10 Handy Online Image Editors. Well, today I’ll write something similar. If you are a Linux user and you are looking for a good image viewer then here’s a list of some Linux image viewers. Picasa is an application for organizing and editing digital photos. It is available on both PC as well as Linux. With Picasa, you can organize, create, edit and share images with ease. gThumb is an open-source image viewer and organizer for the GNOME desktop environment released under the GNU General Public License. It was originally based on GQView, and is designed to have a clean, simple interface. GPicView is the standard picture viewer of LXDE. GPicView features lightening fast startup and intuitive interface. It is extremely lightweight and fast with low memory usage. Ristretto is basically designed for the Xfce desktop environment. It’s just a picture viewer and doesn’t have any other functions like editing images. If you want to open PDF files, you’ll need a different program. So, if you want just a picture viewer then download it. It’s a strong adherent to the one-task, one-tool mindset so prevalent with Linux users. The Eye of GNOME image viewer is the official image viewer for the GNOME Desktop environment. With it, you can view single image files, as well as large image collections. It supports a variety of image file formats. The GdkPixbuf library determines which file formats Eye of GNOME can load and save. F-Spot is a pretty light image viewer and organizer for the GNOME desktop. It has an extremely user friendly interface. It also supports advanced features such as tagging images and displaying and exporting Exif and XMP metadata. KSquirrel is an image viewer for the KDE desktop environment with a disk navigator, file tree, thumbnails, extended thumbnails, dynamic format support, DCOP interface, KEXIF and KIPI plugins support. It supports more than 57 image formats, including PNG, JPEG, PSD, APNG, GIF, WMF, OpenEXR and many others. Feh is an image viewer using the imlib2 library to open and manipulate images. feh has a large number of operational modes. The default mode is an image slideshow, showing one image at a time from those specified on the command line. Keys and mouse control may be used to move through them. 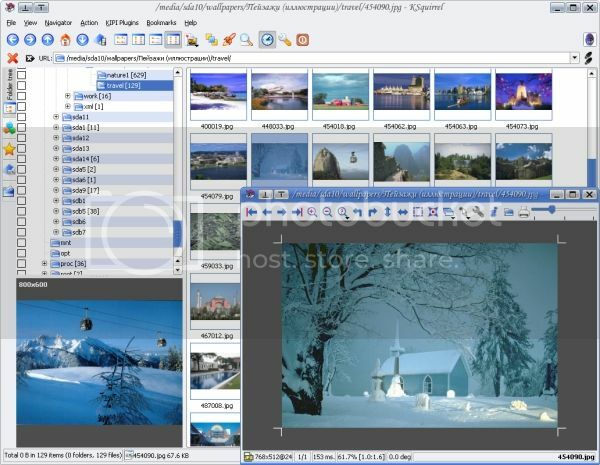 DigiKam is an image organizer and editor using KDE. It runs on most known desktop environments and window managers if needed libraries are installed. It supports all major image file formats, and can organize collections of photographs in directory-based albums, or dynamic albums by date, timeline, or by tags. You can also add captions and ratings to images. imgSeek is a photo collection manager and viewer with content-based search and many other features. GQview is an image viewer for Unix operating systems. Its key features include single click file viewing, external editor support, thumbnail preview, and zoom features. Some image management features are also included. Gwenview is an image viewer for the KDE desktop environment. It has an extremely user friendly interface which makes it easy for a user to browse through a huge collection of images. It can load and save all image formats supported by KDE. It correctly displays images with alpha channel, using the traditional checker board as a background to reveal transparency. Comix is basically an image viewer for viewing comic books. It also serves as a generic viewer. It also reads images in ZIP, RAR or tar archives as well as plain image files. It is written in Python and uses GTK+ through the PyGTK bindings.